As a member of Professor David Howard's lab here on campus I am involved in doing research on the single celled green algae Chlamydomonas reinhadtii. The goal of our lab's research is to analyze the flagella of Chlamydomonas and determine how they are regulated by certain enzymes and different protein dynein motors. My individual part of the project is to compare different C. reinhardtii mutants through photomicroscopy. The mutants I examine have alterations to their inner dynein arms. 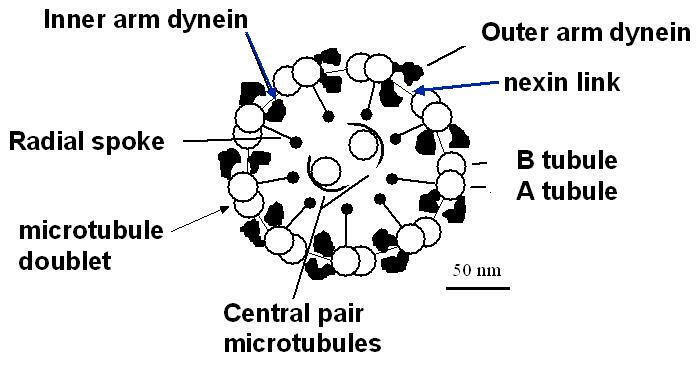 The diagram in the upper left is of an axoneme which is the cross section of a flagellum in Chlamydomonas as you can see the microtubules are set up in a 9 + 2 arrangement with inner and outer dynein arms. The dynein arms essentially slide up and down adjacent microtubules and cause tension within the flagellum. In the upper right you can see that the tension results in the waving of the flagellum in turn enabling the cell to propel itself through liquid medium. 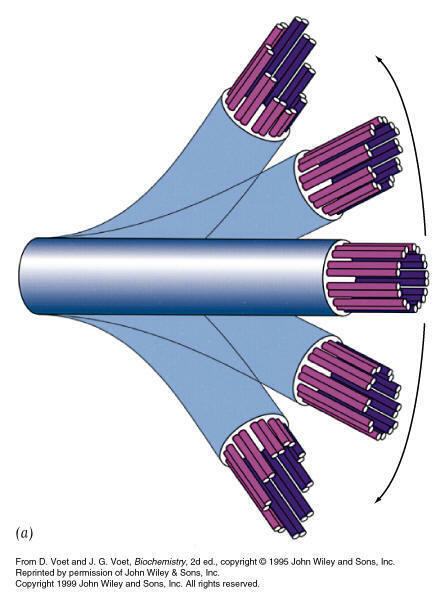 The diagram above shows a longitudinal section of a microtubule with the inner arms in color. As I said before my part of the project was to take recordings through microscopy of different mutants which were missing some of these components. Although the project is ongoing some of the results we have seen show far are quite interesting. The video above is of the wild type cell (cc124) which we basically used as a control to compare all the other mutants to. As you can see the cell has a very fluent breaststroke like motion with long extended strokes. This mutant is referred to as ida4, it was missing inner arm dyneins a,c, and d. As you can see from the video it is struggling to produce full effective strokes with its flagellum. This leads us to believe that those dyneins have somewhat of a significant effect on the motility of the cells. This was probably one of the must interesting things we ran across while testing these mutants. This mutant is called ida3 and is missing the biggest of all inner arm dyneins, the I1 dynein. As you can see from the video this mutant has an alternating stroke comparable to a doggy paddle. These cell's motility was highly inhibited and unproductive which leads us to the theory that the I1 dynein has the biggest effect on regulation of the flagella.